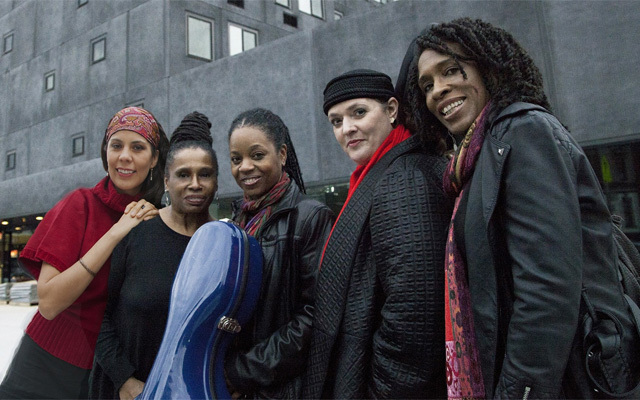 With genealogy going back a generation to Mal Waldron, Reggie Workman and Sonny Rollins, there’s enough stellar energy in Fiery String Sistas to fire up a constellation. Add to that the fact that this is an all-girl group and we have something more to crow about. However, none of that actually matters because, quite simply, each of these five women is prodigious talented in her own right making the proverbial whole infinitely greater than the sum of its parts. What more is there to crow about? The swagger can be hardly contained by the versatility of Mala Waldron, Nioka Workman, Marlene Rice, Melissa Slocum and Karina Colis. 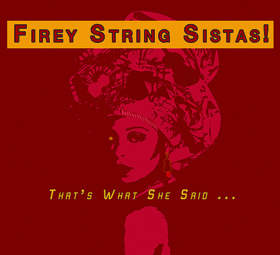 Each of the Firey String Sistas brings a thoughtful approach to original material (the only tune not composed by a ‘Sista’ is Cedar Walton’s “To the Holy Land”). Each musician speaks the language of her instrument with authority, conviction and idiomatic elegance. The result is, of course, That’s What She Said an album of boundless visceral excitement and energy. The lovingly conceived programme begins with cellist Nioka Workman’s “Shine” a piece capturing the delicate colours and wistful melancholy of not only the cello, but the other stringed instruments – that is the violin and bass – as well as Waldron’s piano and Colis’ fan-like unfurling of her percussion palette. Each note, each phrase and line has been accorded all the care and insight of musicians proficient not only in its bluesy orientation, but also in the chamber setting into which each musician brings exquisite improvising skills. While all of the music is melodically intense the hard, swinging rhythm that comes from being schooled in the beguiling pulse of Jazz is very much a part of both ensemble sections and the lofty solos by violin and cello as well as piano, bass and drums. Every member of the ensemble contributes at least one piece, which is rare, especially among newer, contemporary bands. Workman, Rice, Waldron, Slocum and Colis each shape the fluid, expressive lines of the music to remind us that Jazz is not only written in an Afro-American rhythmic language but, in its worldwide realm, a great indefinable modern music that is texturally varied and often lights up an aural canvas with an enormous harmonic palette. Remarkable also is the fact that the music written – which may be written by a bassist or drummer – certainly has not only the tonal and textural palette of melodic instruments such as the stringed ones, or the piano, or even the drums. This is a special testament to the writing skills of bassist Melissa Slocum and drummer Karina Colis. Each of the eight jewel-like miniatures exhibits characteristics not usually associated with a group of this configuration – that is to say, a chamber ensemble that incarnates itself in real time, into a Jazz quintet. The chameleonic nature of the group is remarkable in that it also allows for polyphonic rigour, where improvisational ambiguity gives way towards ecstatic outpouring, rendered with the utmost refinement of touch. Clifton Anderson has expertly produced this recording and praise is also due to the work of engineer Peter Karl who handles the idiosyncrasies of disparate instruments with deft touch, and to Rob Fraboni for mastering. This technical excellence combines well with the deeply personal, naturally expressive playing by the ‘Sistas’ all of which whets the appetite for further releases from the Firey String Sistas. Track List: Shine; Ellie; Adversidad; T’ainchy Blues; Fantasy; Miss Lady; Castle in the Sky; To the Holy Land. Personnel: Nioka Workman: cello, vocals, percussion; Marlene Rice: violin, vocals, percussion; Melissa Slocum: acoustic bass; Mala Waldron: piano, vocals, percussion; Karina Colis: drums, percussion.